Food Trucks @ PAW- 28 Grams Pizza! Tails & Ales Yappy Hour Featuring Guest Bartenders from Deadly Rival! 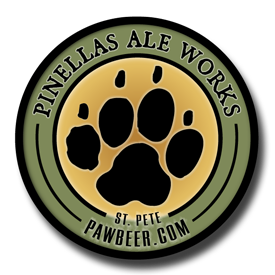 Join Friends of Strays and the ladies from Deadly Rival Roller Derby for our monthly Yappy Hour at Pinellas Ale Works! Han So-Low, Mizfyt, and Doomsday Addams will be behind the bar pouring your pints all night long! Thanks to PAW and an anonymous donor, Friends of Strays will receive $2 from every beer sold between 6:00-8:00. In the Barrel Aging Room- Solar United Neighbors invites you to celebrate solar successes throughout the seasons in St. Pete! Including all of the participants who have gone solar through the St. Pete Winter, Summer and Autumn co-ops! Learn about exciting new ways to get involved with Solar United Neighbors and connect with fellow co-op participants, solar homeowners, and residents who are interested in solar. Light appetizers and beverages will be provided. We're looking forward to celebrating with you! Live Music Sundays- Ken Jones and Bryan Miller Duo!